Years ago, the logging industry was an important industry to the Bridgewater community. Although I was much too young to know the details, I can recall some of the stories related to the loggers and the camps. At one time, there were eight logging camps in Bridgewater. Ed Birmingham owned the logging business. His daughter, Mae (Birmingham) Knudsen remembers going to the logging camps as a young child. Her mother would make a big pot of stew and Mae and her siblings would climb on the buckboard wagon and ride into the camps. One of her memories was seeing the long tables with all the food laid out on it for the loggers: “pies, breads, and just everything.” When I asked Mae if her mother did the cooking for the camps, she said, “No, that each camp had a cook and a cookee”. Their job was to prepare the food for the loggers in the camp. Also, she told me that her mother would drive to Canada and bring some men down to work in the camps in Bridgewater. The Canadian loggers were very experienced in the logging business and were well-known for their skills she said. Then after a time they had to go back to Canada and a new crew would come down to work. One year, Mae remembers, after the logs had been skidded down to the river the boom broke down in Taftsville. Of course, the logs were lost. She recalls how the men still came to work even though they had to wait longer for their pay. 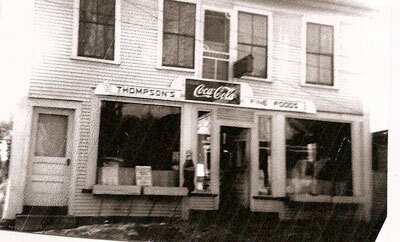 During the heyday of the logging business my mother and my grandmother owned the only restaurant in town, the Thompson’s Restaurant (known today as the Doyle Apartments.) I remember my mother telling me that she always kept plenty of cash on hand so that when the loggers got paid, once a week, they would come to their restaurant and cash their checks. They would stay and eat supper, spend the evening, have a few drinks and spend some of their pay. All the food was homemade: bread, rolls, doughnuts, hermit cookies and hearty food for the loggers. During the time my mother owned the restaurant, she was pregnant for me, which was 1941. Mae’s brother, Reggie Birmingham, brought in a gift for me of little moccasin slippers, which I have kept all these years. There was one particular story my mother related to me that always fascinated me. I asked Mae if she had heard my mother tell that story, and she said she had heard the story. It involved a man, a logger who was at the restaurant at closing time. He needed a ride. My mother offered him a ride. It was at closing time, and Dr. Cramm had been there at the time and he expressed his concern to my mother about her giving this man a ride. She assured him she would be okay. I cannot remember where she gave him a ride to but during the course of that trip, she said he asked her how she dared to give him a ride as he had been in State’s prison. I wish I could remember her answer. It was something to the effect that she did not have that much money, and he would only end back where he had already been. He did not pursue the matter further. The well that supplied the water to the restaurant was hand-dug by my grandfather, Earl Carpenter and his son, Kenneth Carpenter. It was quite a risky project. Apparently the well was quite deep and there was not much in the way of safe guards for them when they were down in the well digging. My mother and grandmother enjoyed a very prosperous business. However, with a new baby, my mother wanted to spend more time at home. My mother and grandmother sold the restaurant to Percy Solger. Percy operated the restaurant for a number of years. Across the street from the Thompson’s Restaurant was the Shell Garage, which was owned and operated by my Dad, Edney Thompson. I believe he owned the garage for only a year or two. The present day building is known as Blueberry Ledges and serves as an antique store. 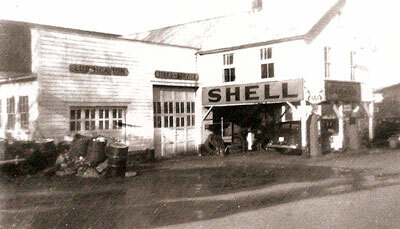 The picture below is how the garage appeared in the 1940s. My Dad owned the garage in 1943 so I think that this picture would be from that time.